Recipe for Honey Sponge Cake. This delicious sweet cake is perfect for Passover since it uses potato starch and matzoh meal instead of flour. Recipe for Passover Coconut Macaroon Cupcakes. 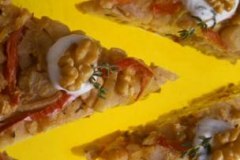 This ingenious Passover recipe is from author Joan Kekst's fabulous book Passover Cookery. Recipe for Amaretti Cookies. These classic Italian almond flavored macaroons are wonderful served by themselves with coffee or espresso. Recipe for Honey Balls for Passover. Honey and healthy walnuts highlight these delicious Passover cookies. Recipe for Passover Jam Thumbprint Cookies. These delicious cookies are perfect for Passover since they use potato starch and matzoh meal instead of flour. Spinach Moussaka -- Pareve or Dairy Options. This is a perfect vegetarian Passover dish. Reprinted with permission from Joan Kekst's Passover Cookery. Recipe for Low Fat Potato Latkes. Here's a baked, low fat version of Potato Latkes. Since the recipe uses Matzoh Meal instead of flour, it's perfect for Passover. Recipe for Apple Walnut Matzoh Kugel for Passover. This recipe makes a wonderful side dish for Passover.